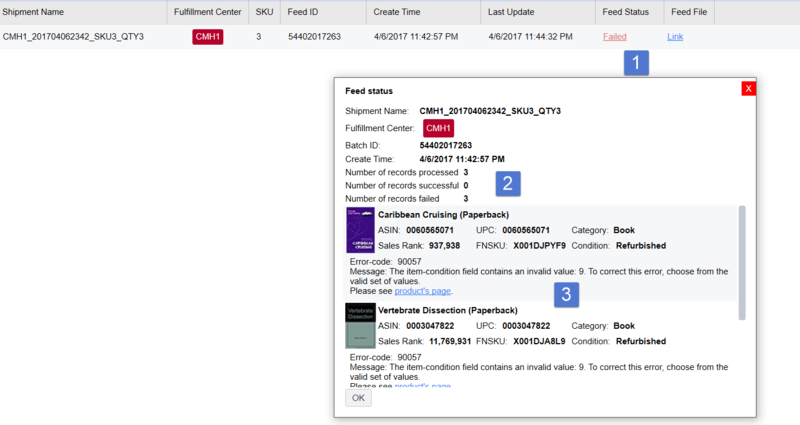 After you create a shipment (FBA) or submit feed to Amazon (MF), you need to check the feed status (1) in Feed screen. You can click ‘Link’ (2) to view the feed file submitted to Amazon. If the feed status is failed, then you need to click on it (1) to see the reason. It will tell you how many items (number of records) are successfully listed, and how many items are not (2). There is a list of failed items (3) that you can review.
! Please make sure the feed status is Completed (Listed on Amazon successfully) or remove your failed items, before you continue the FBA shipment or stock your MF items.